Are you looking for gifts that are useful, of good value and can please most cooks this year? With our picks for the best kitchen gadget gifts 2017, you can be sure that what you get for them won’t be a white elephant. Many of them will inspire the recipient to try out new recipes or even change their way of eating because some are kitchen tools for healthy eating and some make things very convenient in the kitchen. We’ve divided our picks evenly into best kitchen gadget gifts under $20 and best under $50 and all of them make great gifts for Christmas. For gift ideas for men, kids, and small budgets, check out our other kitchen gift guides. This salad-to-go lunch container by Bentgo is really useful to those who like to eat healthy and take homemade salads to lunch. Because mixing all the ingredients in a salad ahead of time will just create a soggy mess, it’s a good idea to keep everything separate until it’s time to eat. The Bentgo box incorporates a smart design within a large 54 ounce capacity, so even those with large appetites can have their fill of a fresh salad. The bottom container can hold your greens or pasta, while the tray on top can hold 3 or more salad toppings separated by the dividers. There’s a lidded 3 ounce sauce or dressing container that goes in the middle. The lid of the whole container fits on top of the tray and seals it airtight by the rubber ring and two side clamps. There’s also a fork that fits in a notch on top of the lid. This BPA-free container is easy to clean in the dishwasher and the bowl can also be microwaved without the lid. For every chef that’s a lover of Italian cooking, the ability to make homemade pasta is a matter of pride. The difference in taste and texture to store bought pasta is unmatched. While you can gift them an electric pasta maker or a hand cranked pasta extruder, it’s also possible to make ravioli with a simple set of hand tools like this Ravioli maker set. It comes with a square and circle ravioli stamp, a dough wheel cutter/crimper, and a pastry dough roller. The latter two tools feature bacteria resistant hardwood handles. First you make the dough and roll it out into a long and even strip to the desired thickness. Then drop little mounds of pasta filling at regular intervals along the strip and cover with another equal sized pasta dough strip. Then using either one of the stamps or the pasta cutter, crimp and cut off the ravioli one by one. This set can also be used to make empanadas or gyozas, so it’s a very useful set to have in the kitchen. Each tool is very easy to use even by young children. Why take 30 seconds to snip your kitchen herbs if you can do it 6? The Jenaluca Herb Scissors and Multipurpose Kitchen Shears makes a great gift for the cook who likes to use fresh herbs but needs to mince them quickly. These kitchen shears feature five 3″ very sharp and perfectly angled blades set parallel and close to each other so that you need to use fewer snips to cut a bunch of herbs nice and evenly. With normal kitchen shears you’ll always find quite a few uneven bits of herbs, but not with this one! Just snip them right over the pot of soup for a mess-free garnish. The TPR grip is soft, lightweight and comfortable to grip. The pair of scissors comes with a protective case for storage which features a comb at its other end to brush loose bits from between the blades of the scissors. You can just rinse them under water but both are also dishwasher safe. In addition to Cilantro, Rosemary, Basil, Dill, Parsley, Chives, and Mint, this pair can also be used to cut bell peppers, celery, mushrooms and more. It can even be used as craft scissors to cut card stock and fringe! making pancakes doesn’t necessarily need you to use a manual whisk that takes a long time to get an absolutely smooth batter, nor does it need an electric immersion blender that is not so easy to clean. The absolute easiest and fastest way to make the batter is to use a batter mixer with a whisking ball inside. After adding all necessary ingredients to this manual mixer bottle through the base opening, you screw on the base back on and shake vigorously for just a few seconds. The wire whisk ball inside blends everything to a smooth batter. When you’re ready to start making the pancakes, you just unscrew the top cap and pour the amount of batter you need onto the pan. You control the amount and flow for perfectly even pancakes. You can also screw the top on and shake between each pour so that you’re not left with extra thick batter at the end. Not something that’s easy to do with an electric blender! The base opening is wide enough that you can pour in the flour, etc. without spilling. For an extra stable base while cooking, the base cap can be used as a stand. This gadget is also really easy to clean, as all you have to do is fill it with warm soap and water, close it and shake a few times and rinse. This microwave popper is the simplest type popcorn maker gadget you can buy. There are electric popcorn makers and stovetop poppers, but you can pop corn just as easily in a microwave. This gadget is made of PVC and BPA-free premium food grade silicone that’s dishwasher-safe and heat resistant, so you eliminate the health risks of popcorn bags and the risk of burnt kernels when doing it on the stove. It’s also faster than using an electric device, not to mention needing extra storage space for it. You can make up to 15 cups with the HotPop and it will all be popped in 2-4 minutes. Just add the kernels and the optional oil or butter to the device, cover with the lid and go. You’ll know when it’s done when the lid pops open. To store, the container collapses to just 2.4″ in height so it doesn’t take up much space at all. A baker or chef who cooks with butter or just someone who wants to butter her toast needn’t have to struggle with measuring out and cutting up the right amount of butter from a stick. This butter cutter does both for you with just one click of a button. Instead of keeping your butter in a butter tray, put a stick in this cutter and keep it in the fridge until needed. When ready, take out the cold cutter, hold it over the cooking pot, slice of toast or roasting turkey and press the button. The inner stainless steel blade cleanly cuts a pat of butter that falls out from underneath. Do this as many times as you want to get the final desired amount for your recipe. If you use standard 4.75 inch long, 1/4-pound bars of butter, 1 tablespoon equals 4 pats. With this device, your hands remain clean and so does the butter. No crumbs of toast left in it after buttering your bread! Making sushi at home may not look that different, but anyone who’s tried it will tell you that getting tight little parcels made up of two or more layers of fish, cucumber, avocado, nori, rice and sesame seeds is quite a tricky task. Not only does making the roll take work, but you have to ensure that it doesn’t fall apart when you cut it into pieces. That’s why the Sushiquik Super Easy Sushi Making Kit is a no brainer gift for any sushi lover. Now they can have sushi more frequently without breaking the bank at restaurants. Even beginners will find it easy to use. The kit comes with sushi making stand that sits under a square rolling mat that you set a nori sheet over and a square frame that you place around that. The rolling mat is designed to roll into a cylinder to make a maki roll of perfect thickness. You spread sticky rice over the nori sheet using the included leveling spoon, and the frame prevents the grains from going over the edge. You then line up whatever fillings you want on top of less than one half of the rice layer. Then remove the frame and lifting the edge closest to the fillings, tightly roll the mat along with the layers into a cylinder. Secure the ends of the roll with the two included end caps and place the knife guide over the roll. With a knife, cut through the slots in the guide all along the roll. When done, remove the knife guide and end caps and unroll the mat. You’ll be left with a row of perfectly even and neat pieces of sushi! Once the user has perfected making sushi with the nori sheet on the outside, he or she can even do it with the rice on the outside. The rolling mat should be sprinkled with water first to bind the rice grains together. The end caps are great to use as soy sauce cups, and all the components of the kit are dishwasher safe for easy cleaning. Who doesn’t love pies? Whether sweet or savory, they’re always a treat for the family or for a party, especially for Thanksgiving or Christmas. However, one standard size pie is only good for a fixed number of people, which is fine if you have more pie than people, but you certainly don’t want to run short at a party! Instead the cook can make mini personal pies so that she can easily scale her recipe to suit the size of the party. The Chef’s Choice 860 Petite Pie Maker lets you make four 4″ diameter personal pies at a time and very quickly too. It looks just like a sandwich maker on the outside but the inside features four pastry wells on the top and bottom non-stick grill plates. You switch the appliance on and wait until the “ready” light comes on and it beeps before you fill each bottom well with a pastry circle, fill them with a sweet or savory filling and cover them with another pastry circle. Close the pie maker lid, set the timer and start the unit. The pie wells have crimped edges to make proper seals. The “baking” light will be lit until the timer reaches 0, and the unit will automatically shutoff so that you can open the unit to easily remove the pies. The turnaround time to start the next batch of pies is very short, so making several in quick succession is possible. The cook doesn’t have to keep an eye on them as they cook because it completes on its own and beeps to let you know when they’re done. Another gadget that would be really appreciated by cooks that like to make foods from scratch at home, is a butter churn. With just one simple ingredient – whipping or heavy cream, pure and fresh butter can be made quickly and easily. The churn is composed of a 34-fluid ounce capacity glass jar and a hand cranked churn with lid. You fill the jar with the cream and screw on the lid with the churning paddles immersed. Then start cranking until the butter has formed and you can’t crank anymore. This take approximately 10 minutes. You open up the jar and pour out the buttermilk that has separated out from the butter and spoon or paddle out the butter into one bowl. Then with a pair of paddles, you separate and squeeze out excess buttermilk from the formed pat of butter before storing it in a butter tray for the fridge or dinner table. The buttermilk can be used to make pancakes or baked goods. 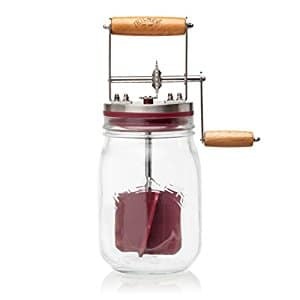 If you can spend more than $50, you should get the whole Kilner set of churn along with the beautiful glass butter dish and deep-grooved pair of wooden paddles. Available in white, black or red, this toaster isn’t just any old toaster. It’s one that lets you see the bread getting browner so that you have complete control over the doneness. Let’s face it, one of the key features that people want in a toaster is to have consistent results everytime, which is not always the case with a standard toaster, whether it’s a four slice one or a long slot one. In addition to the 7 browning levels, there are also buttons to toast bagels or defrost or reheat bread. You can watch the progress through the side glass panel and either let the auto-shut off finish the process, or you can preempt the process if you see the bread reach your desired level of brownness. The slots are extra wide to accommodate artisan bread and there’s a slide out tray that catches crumbs.